You must be a member of the New York Speaks German Group to attend this activity. Would you like to join this group? In November Protected content will have been 30 years since the fall of the Berlin wall which I witnessed myself living in Berlin. 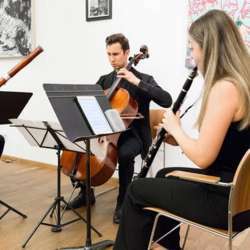 The German Consulate General and the Mannes Sounds Festival present a free concert (Bach, Lachenmann, Eisler, Ronneburg, Mazzoli and Beethoven). Registration opens 1/11/19, click on the venue link above to reserve your spot on eventbrite. We meet at curbside between 5:30 and 5:40pm and go inside at 5:40pm or so. There are usually lines for security check to get in so try to arrive early. A day before the event I will send an email with my cell phone number to text in case you can not find the group. Mannes Sounds Festival: “Celebration of the 30th Anniversary of the Fall of the Berlin Wall"
Since the year Protected content , Mannes Sounds Festival has presented annual concerts on a wide range of topics as part of the Mannes Sounds Festival at the German Consulate General. This time the festival concert presents “A Celebration of the 30th Anniversary of the Fall of the Berlin Wall”. This extraordinary event in November Protected content the world and signaled the new era of democracy for Eastern Europe, the end of the Cold War, and brought the unification of Germany on October 3rd, Protected content . Some of the greatest musicians of the world went to Berlin to celebrate with the people of Germany and the rest of the democratic world. The famous cellist Mstislav Rostropovich played at the remains of Wall the Cello Suites by J.S.Bach. Leonard Bernstein conducted Beethoven’s Ninth Symphony. The concert on February 28th, which presents the outstanding young artists of Mannes School of Music, opens with the Prelude from of the C Major Suite and the Sarabande from the D Minor Suite by Bach, followed by “ Five Variations on a Theme by Schubert” by the prominent contemporary German composer Helmut Lachenmann. We present also a selection of songs by Hans Eisler who fled Nazi Germany and came to live and establish important career in the USA as a composer and educator. For several years, between Protected content taught at The New School in New York. Subsequently he returned to Germany. A very special work on the program, “Bahnhoffnung” was written specifically for this concert by the young German/American composer, Karl Ronneburg, who studies currently at Mannes. His grandfather escaped East Germany, taking a train from East to West Berlin. The title combines two words, „station“ and “hope”. This piece for tenor, trumpet and piano is a reflection of the grandfather‘s diaries. You will hear “The Sound of Light” for flute, violin, trombone, trumpet and piano by Missy Mazzoli, one of the most established and performed American composers, who is on the faculty of Mannes. The closing piece of the event is Beethoven Piano Trio op.1 No.1 in E flat Major.